A record turnout of 93 members and guests assembled at the start point in Hawkes Mill Lane on this hot summer’s evening. 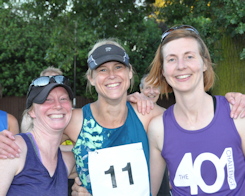 Each team of three were free to choose their own running order, the later runners taking benefit from the gradually reducing temperature, and an improvement on previous years saw teams given numbers to wear to make result scoring easier. Bottles of wine were presented to the winning team of Amanda Deavy, Cath Fenn and Katy Davies. The second team of Damien Dear, Tony French, and Tony Forde and the third placed Sphinx AC guest team of Ellie Davis, Collette O’Keefe and Lisa Abbott received chocolates as prizes. For full details of this unusual event go to the GBU page. Starting and finishing at Longford Hall, Salop, this was almost entirely off road. What a lovely course – complete with a stile and kissing gates. 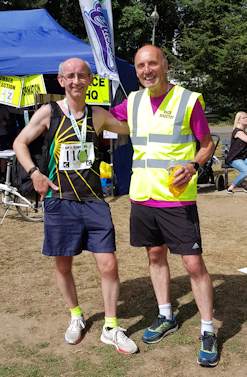 The course is quite narrow at times so passing isn’t so easy, but it’s a well organised run with plenty of marshals and extra water stations laid on as the weather was so good (23C). I was slightly quicker than in the Kenilworth 10K on May Day, but this was so much more enjoyable. Keen to get a 10 mile race in ahead of the season half-way point, I spotted this event in the heart of the stockbroker belt. 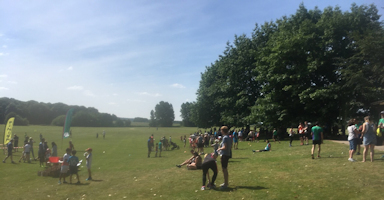 The event was billed as flat, but took in a variety of terrain as we started on the grass of the Thames Ditton cricket pitch, before taking to the roads of the surrounding area. It was then onto mud paths through some woods whereafter we ran alongside the Thames for a few miles, then through Kingston town centre, over the Thames and headed back on gravel paths alongside Hampton Court, adjacent to Bushy Park, the birthplace of parkrun. The final few miles required concerted effort as energy was waning and temperatures rising. An enjoyable event, although I could have done with pacing at one third of the speed to take in the rich history I was passing by. 33 miles and 10,000ft of climbing in the Lake District. 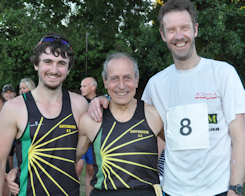 The Northbrook vest was in clear evidence at the 5th race of the Warwickshire Road Race League with a 80-strong contingent of club members making up a considerable portion of the field. 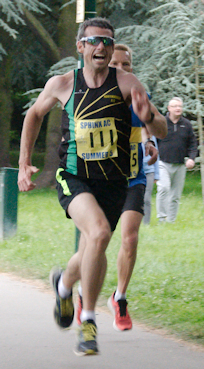 Andy McConville led them home, and Amanda Deavy was the first of the Northbrook women to cross the line. What can I say. This was an exercise in humility, and an illustration of no training = no pb. Apart from A Coventry Way training I’ve only run further than 10k four times since 2015. And it showed, slowest time ever – by 10 mins! The race is organised almost entirely by one man. 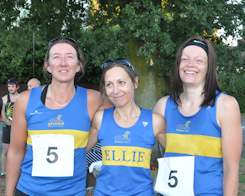 The course is lovely, inland to the coast, up and down one hill (about 3k up and 3k down), back to the coast and the last 5k along the St Aubin – St Helier promenade. Lovely medal and a tech tee. Will do again. A warm day saw 5 Northbrookers and a merry band of supporters heading to the little village of Tysoe. Nestled at the bottom of the hill on which the windmill sits, obviously some inspired race director thought of this course while looking upwards. It’s not flat, and there are steps to descend from the windmill on one side. But the views from the top (and you hit the top 3 times) are fantastic.